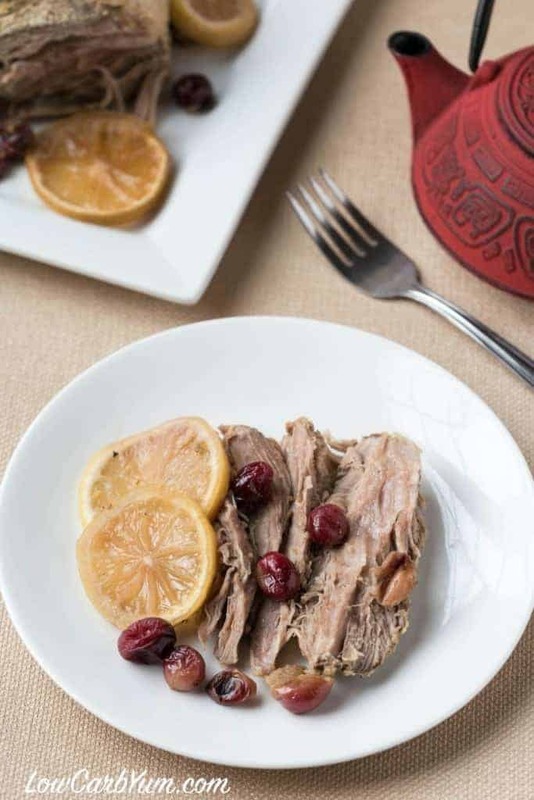 Now is the perfect time to enjoy a crock pot pork roast recipe with cranberries. 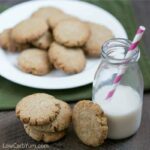 With less than five minutes to prepare you’ll have plenty of time to enjoy other things while the slow cooker does the cooking. The cranberries are here! At least they have arrived here in Southern New England. For me, it’s officially the start of the holiday season when I see these fresh berries in the grocery store. I just wish I had more time to experiment with them. A friend of ours gave us a huge pork loin over the summer that I chopped up and vacuum sealed to eat over several months. One of these pieces was perfect to try a crock pot pork roast recipe. If you’ve been following me for a while, you know that I just love recipes that have quick preparation. I’m a busy person and I don’t have a lot of time to spend in the kitchen. This is a recipe that will take you less than five minutes to prepare. And, you can easily adjust it to feed the size of your family. My older two kids are in college now, so it’s just me, my husband and a two year old eating at home. So, I usually make my meals to feed four, unless I’m making extra to eat as leftovers at work. I’ve got a 3-in-1 crock pot that has three different size crocks: 2-, 4-, and 6-quart. 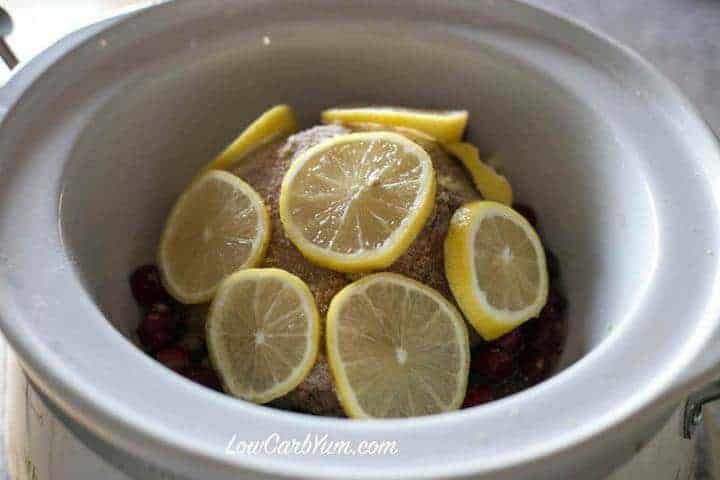 I used the medium 4 quart bowl for this cranberry crock pot pork roast recipe and it was the perfect size. To get the seasoning and coconut flour to stick evenly to the meat, I put the dry seasoning mix in a large zipper bag and then placed the pork in and shook it around. It’s much easier to use a bag than dip the meat and the coating is always evenly stuck to the surface of the meat. Some recipes call for using prepared cranberry sauce. 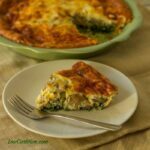 You can use that if you have some leftover from the holidays or another meal. Or, you can simply add the sauce ingredients to the crock pot and let it cook up with the meat. 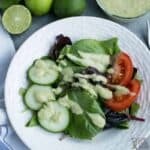 The sliced lemons give a nice citrus flavor without adding a lot of carbs. You can eat them if you wish, but I just used them as garnish. 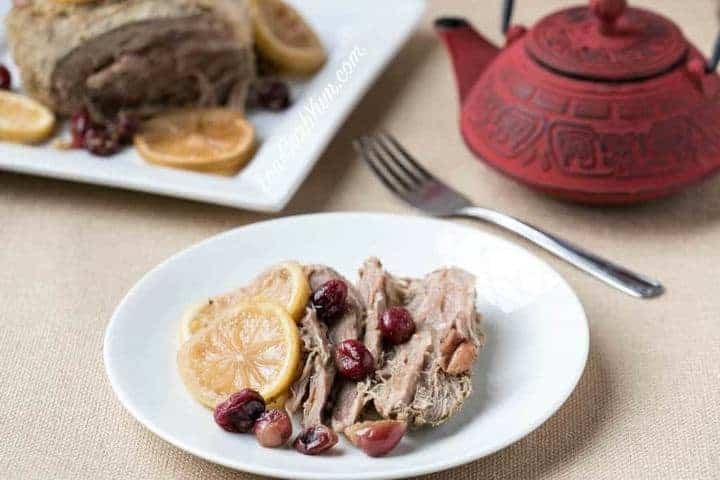 The lemon flavor with soak into the meat. The cranberries and lemon are very tart so you do need to add sweeteners. If you find that it’s too bitter, feel free to add a few drops of stevia to the sauce. I tried to add as little sweetener as possible and I don’t like sweet sauces on my meat. I used just enough to get rid of most of the tart flavor. Personally, I like cranberry dishes to keep some of the tartness. However, you may prefer it to be sweeter. 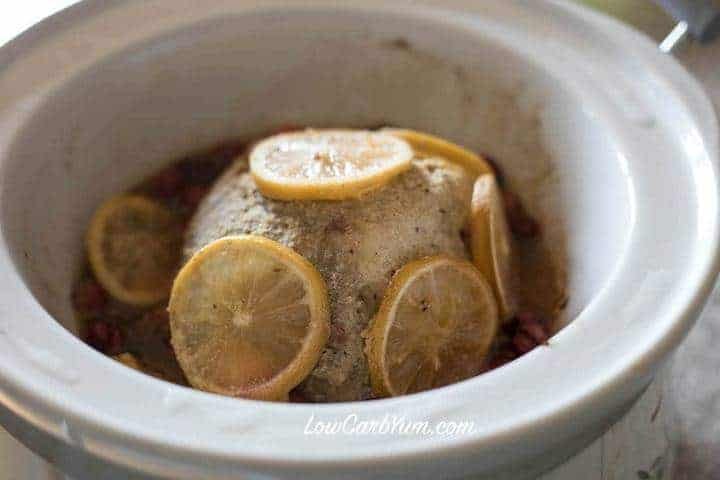 This crock pot pork roast recipe resulted in meat that was nice and tender after slow cooking. I let it cook on low for a little over 8 hours. I wanted to make sure the cranberry flavor got into the meat so I did lift the lid on the crock to spoon the sauce on the meat a couple times during cooking. I just love how tender and juicy meat comes out when it is slow cooked. I really need to make these easy crock pot dinners more often. This is something that I could put together quickly the night before and set in the crock pot before leaving for work. Then, I’d have a nice warm comforting meal when I get home in the late afternoon without having to lift a finger. Sounds dreamy, doesn’t it? 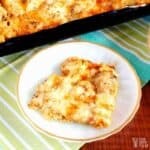 If you like the idea of slow cooking during the work day, try my recipes for Crock Pot chicken and my Slow Cooker Squash Casserole. Now is the perfect time to enjoy a cranberry pork roast. And with less than five minutes to prepare, you'll have time to enjoy other things. Place coconut flour, ginger, mustard, salt and pepper in large plastic bag. Add roast and shake to coat. Place meat in crockpot (I used a 4 quart round). Sprinkle cranberries and sweetener around the sides. Add garlic and pour water in. Arrange lemon slices over meat. Cover and cook on low 6-8 hours, spooning liquid over meat occasionally as needed during cooking. 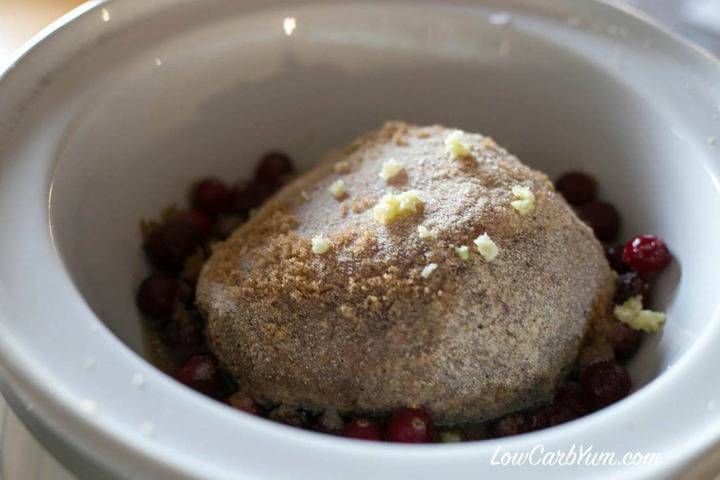 [post_content] => Now is the perfect time to enjoy a cranberry pork roast. And with less than five minutes to prepare,  you'll have time to enjoy other things. 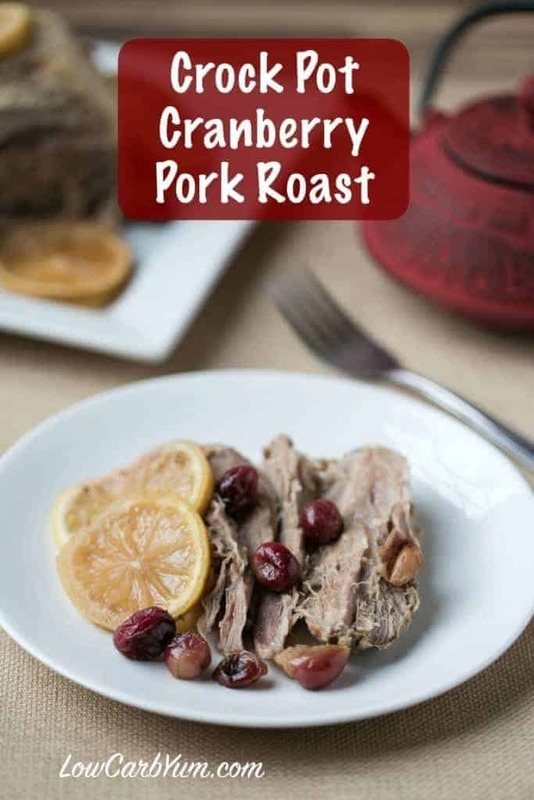 Cranberries with pork are such a great combo, can’t wait to try this! This roast looks fantastic! 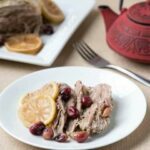 I love cranberries with pork, such a winning combo!I like the idea of adding coconut flour to season it! The 1/8 tsp Mustard – I assume that’s dry mustard powder not prepared yellow mustard? Yes. Sorry for not specifying. Fixing!